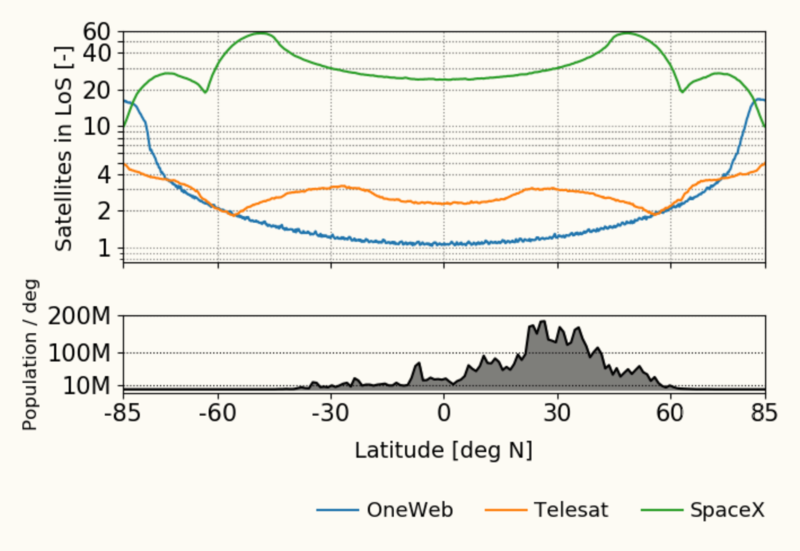 Inigo del Portillo and his colleagues at MIT have run a simulation comparing OneWeb, SpaceX and Telesat's proposed low-Earth orbit Internet service constellations. The models are based on the initial FCC filings by the companies and demand and data-rate estimates by the authors. (I will mention subsequent amendments to the filings below). With 4,425 simulated satellites, SpaceX is the clear leader in all but the extreme north and south, but Telesat, with only 117 satellites, averages more visible satellites than OneWeb with 720 because their minimum elevation angle is 20 degrees while OneWeb's is 55 degrees (SpaceX's is 40 degrees). Note that marginal improvement diminishes as the number of ground stations increases. 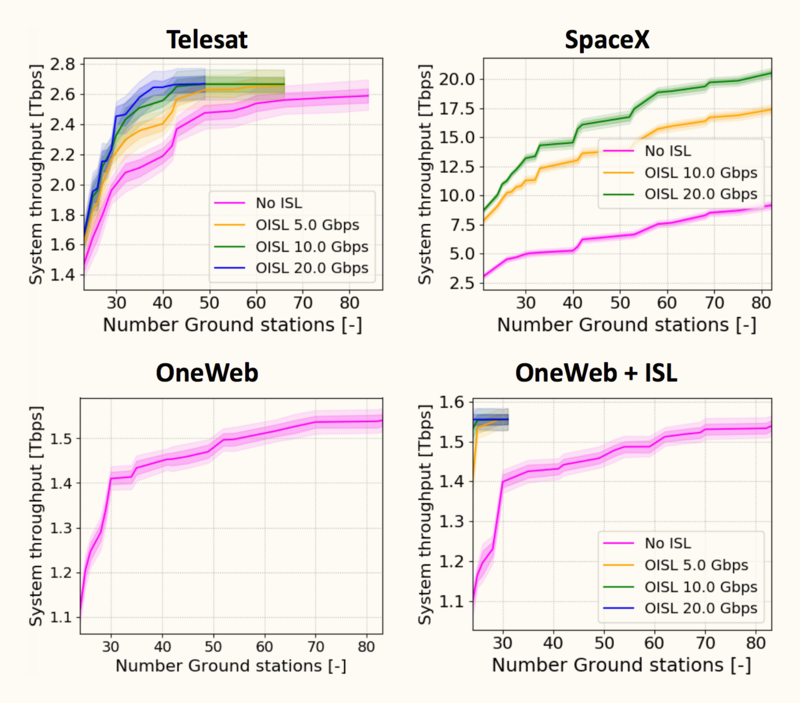 For example, with 50 ground stations each, the throughputs are SpaceX 16.8, OneWeb 1.47 and Telesat 2.66 Tbps. Since SpaceX has their own launch capability, they can afford to begin at very large scale, giving them a significant capacity advantage, but Telesat has a significant lead in capacity per satellite. Putting these constellation capacities in context, Telegeography reported that global International bandwidth in 2018 was 393 Tbps, two-thirds of which has been deployed since 2014. Satellite constellations with OISLs will add to that total and provide lower latency times than international terrestrial cables. As mentioned above, there have been some changes in plans since the FCC filings upon which these simulations were based. OneWeb has reduced the number of satellites in their constellation to 600 and eliminated ISOLs and SpaceX has lowered the altitude of their constellation from 1,100 to 550 km and cut the number of ISOLs per satellite from 5 to 4. (SpaceX was also authorized to use V-band spectrum, but that may be for their planned VLEO constellation). I asked del Portillo whether they had rerun the simulations using the revised plans, and he said they had not, but he did not think that the numbers for total throughput and number of ground stations would vary a lot for SpaceX and he expected the total system throughput would decrease slightly for OneWeb because of the reduced number of satellites. He also expressed concern about OneWeb being able to provide continuous coverage near the equator where there might be coverage gaps or lower data-rates. (Note that the simulation focused on end-user and backhaul demand, not marine and in-flight connectivity which are priority markets for OneWeb). SpaceX appears to have financing in place to cover their initial launches and achieve high capacity early and Telesat is making a much smaller initial investment, but should be able to scale up as demand increases. Based on this simulation and problems they have encountered with their Russian partners, OneWeb may be falling behind. I've summarized some of the results of these simulations, but you should read the paper for details on the model structure, assumptions and a discussion of technical challenges. You can also check out this slide presentation on the paper. I also recommend an earlier paper and accompanying videos on a simulation that predicts routing redundancy and latency with SpaceX's planned broadband constellation.